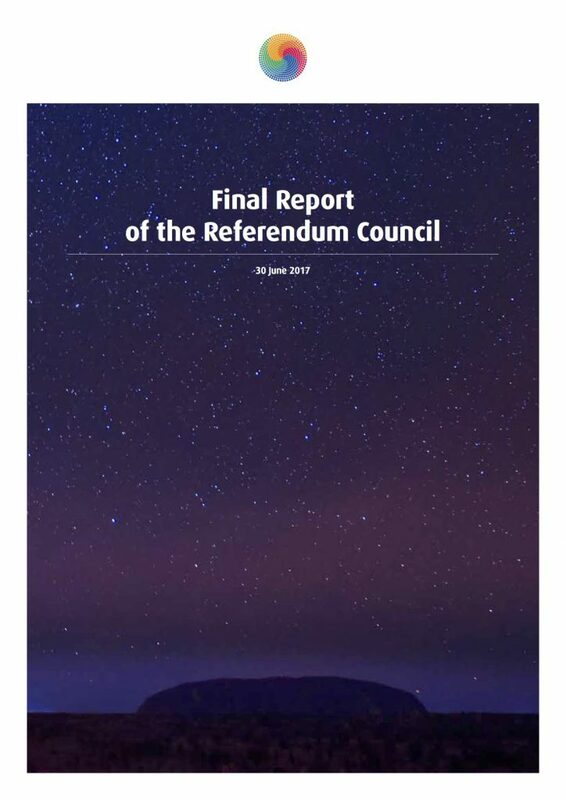 Australia – The Referendum Council (@ref_council) delivered its Final Report on June 30, 2017. You can download the Final Report in PDF format (4.1MB) here. Aboriginal and Torres Strait Islander peoples have long struggled for constitutional recognition. As far back as Yorta Yorta elder William Cooper’s letter to King George VI (1937), the Yirrkala Bark Petitions (1963), the Larrakia Petition (1972) and the Barunga Statement (1988), First Peoples have sought a fair place in our country. I believe we must find room in our national life to formally recognise the special status of Aboriginal and Torres Strait Islanders as the first peoples of our nation. These promising intentions never came to pass. They nevertheless con rm constitutional recognition is longstanding and unfinished business for the nation. What Aboriginal people ask is that the modern world now makes the sacrifices necessary to give us a real future. To relax its grip on us. To let us breathe, to let us be free of the determined control exerted on us to make us like you. And you should take that a step further and recognise us for who we are, and not who you want us to be. Let us be who we are – Aboriginal people in a modern world – and be proud of us. Acknowledge that we have survived the worst that the past had thrown at us, and we are here with our songs, our ceremonies, our land, our language and our people – our full identity. What a gift this is that we can give you, if you choose to accept us in a meaningful way. Hon Malcolm Turnbull and Opposition Leader the Hon Bill Shorten then established this Referendum Council in December 2015. This report builds on the work of the Expert Panel and the Joint Select Committee. It takes into account the political and legal responses to the earlier reports, as well as the views of Aboriginal and Torres Strait Islander peoples and the general public. We were required to consult specifically with Aboriginal and Torres Strait Islander peoples on their views of meaningful recognition. The 12 First Nations Regional Dialogues, which culminated in the National Constitutional Convention at Uluru in May 2017, empowered First Peoples from across the country to form a consensus position on the form constitutional recognition should take. This is the first time in Australia’s history that such a process has been undertaken. It is a significant response to the historical exclusion of First Peoples from the original process that led to the adoption of the Australian Constitution. The outcomes of the First Nations Regional Dialogues and the National Constitutional Convention are articulated in the Uluru Statement from the Heart. The findings of our broader community consultation supported the findings of the First Nations Regional Dialogues. This strengthens our conviction that the Voice to the Parliament proposal and an extra-constitutional Declaration of Recognition will be acceptable to Aboriginal and Torres Strait Islander peoples and to the broader Australian community. We propose these reforms because they conform to the weight of views of First Peoples expressed in the First Nations Regional Dialogues as well as those of the wider community. With focussed political leadership and continued multiparty support for meaningful recognition, the Voice to the Parliament proposal can succeed at a referendum. The consensus view of the Referendum Council is that these recommendations for constitutional and extra-constitutional recognition are modest, reasonable, unifying and capable of attracting the necessary support of the Australian people. A statement by Amanda Vanstone is at Appendix E.
1. That a referendum be held to provide in the Australian Constitution for a representative body that gives Aboriginal and Torres Strait Islander First Nations a Voice to the Commonwealth Parliament. One of the specific functions of such a body, to be set out in legislation outside the Constitution, should include the function of monitoring the use of the heads of power in section 51 (xxvi) and section 122. The body will recognise the status of Aboriginal and Torres Strait Islander peoples as the rst peoples of Australia. It will be for the Parliament to consider what further definition is required before the proposal is in a form appropriate to be put to a referendum. In that respect, the Council draws attention to the Guiding Principles that emerged from the National Constitutional Convention at Uluru on 23–26 May 2017 and advises that the support of Aboriginal and Torres Strait Islander peoples, in terms of both process and outcome, will be necessary for the success of a referendum. In principle, the establishment by the Constitution of a body to be a Voice for First Peoples, with the structure and functions of the body to be de ned by Parliament, may be seen as an appropriate form of recognition, of both substantive and symbolic value, of the unique place of Aboriginal and Torres Strait Islander peoples in Australian history and in contemporary Australian society. The Council recommends this option, understanding that finalising a proposal will involve further consultation, including steps of the kind envisaged in the Guiding Principles adopted at the Uluru Convention. 2. That an extra-constitutional Declaration of Recognition be enacted by legislation passed by all Australian Parliaments, ideally on the same day, to articulate a symbolic statement of recognition to unify Australians. A Declaration of Recognition should be developed, containing inspiring and unifying words articulating Australia’s shared history, heritage and aspirations. The Declaration should bring together the three parts of our Australian story: our ancient First Peoples’ heritage and culture, our British institutions, and our multicultural unity. It should be legislated by all Australian Parliaments, on the same day, either in the lead up to or on the same day as the referendum establishing the First Peoples’ Voice to Parliament, as an expression of national unity and reconciliation. Torres Strait Islander peoples, as articulated in the Uluru Statement from the Heart, that can be addressed outside the Constitution. The Uluru Statement called for the establishment of a Makarrata Commission with the function of supervising agreement-making and facilitating a process of local and regional truth telling. The Council recognises that this is a legislative initiative for Aboriginal and Torres Strait Islander peoples to pursue with government. The Council is not in a position to make a specific recommendation on this because it does not fall within our terms of reference. However, we draw attention to this proposal and note that various state governments are engaged in agreement-making. broken promises of diishonoured & unfulfilled treaties.